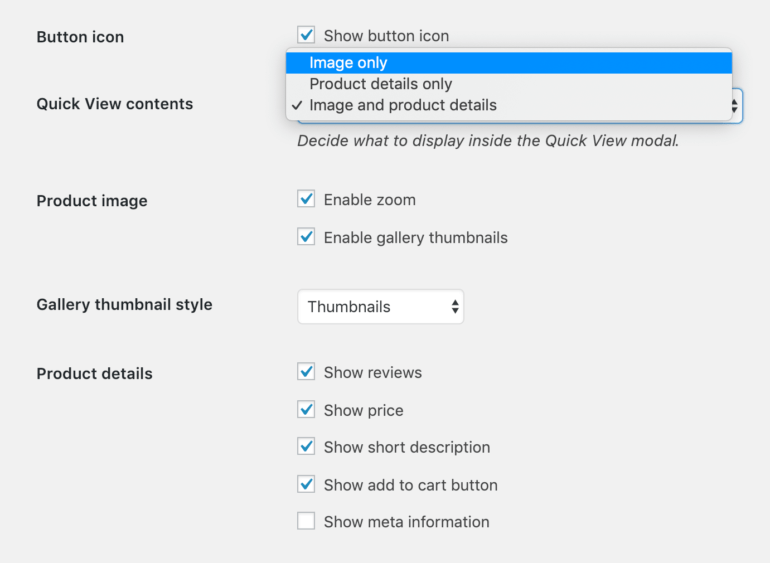 The WooCommerce Quick View Pro plugin settings page (WooCommerce -> Settings -> Products -> Quick view) lets you control the appearance and content of the quick view. Open using Quick View button – depending on your theme, this option adds a button or link immediately before the add to cart button. You can also leave both boxes unticked to disable the quick view from these pages. This option controls the text that appears in the quick view button. For example, you may wish to reword it to ‘View’, ‘Customize’ or ‘Show Gallery’ depending on how you are using the quick view. Tick this box to display a quick view ‘eye’ icon in the button. If you tick this box and add button text in the field above, then the button will contain an icon and the text. If you tick this box and leave the ‘Button text’ field blank, then the button will only contain an icon and no text. Image only – Select this option if you only want the quick view lightbox to show the product featured image, plus any additional images if you have enabled the gallery. This is a good option if you simply wish to display larger images or multiple images in a lightbox, without including extra information about the product or purchase details. For example, a photographer might combine this option with the ‘Open from product name/image’ option above to show bigger versions of the images they are selling. Product details only – Select this option if you want the quick view lightbox to show extra product information or purchase options, without any images. This is a good option if you’re selling non-visual products that don’t rely on big images. Image and product details – This is the most popular option and replicates the top part of the single product page in a typical WooCommerce store. On desktop layouts, the product image(s) appears on the left and the product details appear on the right. On small screen sizes such as mobiles, the layout will stack and the image(s) will appear at the top, with the product details underneath. Enable gallery – If you have uploaded images to the product gallery section of the ‘Add/Edit Product’ screen (as shown in the screenshot), then this option will display the thumbnails of the other gallery images underneath the main product image in the lightbox. Customers can click on a gallery image to view a bigger version of it above. Enable zoom – Allow customers to zoom in to view a close-up version of the image when they hover over it. Note: The zoom will only work if the product image files are larger than the image size shown in the quick view. Show price – Displays the product price underneath the name and reviews. Show meta information – Displays meta information about the product at the bottom of the quick view lightbox. This depends on the product and can include information such as categories, tags and the product’s SKU code.